Bohdan Cherkes was born in Lviv in 1953. He studied architecture there and in Moscow. He is the director of the Institute of Architecture at Lvivska Polytechnic University, professor at the UR Krakow and a visiting professor in Vienna. 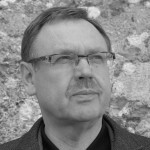 His work focuses on architecture and urban planning as expressions of political power, ideologies and national identity. From 1999 to 2001 he was the Eastern Europe coordinator of the exhibition »Glück Stadt Raum in Europa 1945–2000« (Berlin, 1999–2001), became a corresponding member of the Saxon Akademie der Künste in 2003, and received the honorary title of »Merited Artist of Ukraine« in 2013.